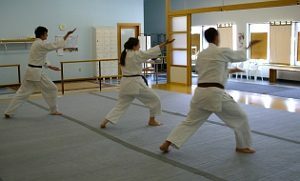 Aikido Yoshokai of Minnesota is a 501(3)(c) non-profit organization that admits any students regardless of nationality, ethnicity, race, gender, gender identity or sexual orientation. Aikido Yoshokai of Minnesota is committed to supporting all students in their study and practice of Aikido. All donations are tax-deductible and go towards to operation of the dojo. © Copyright Kobukan Aikido, AYM, and AYANA. All rights reserved.